I’m excited to show you this quilt today! A while back I received an unexpected package from Windham Fabrics that included this great bundle of their upcoming Artisan Cottons. I was excited to see that they were adding these gorgeous shot cottons – I’ve always loved the extra depth that these cross weaves provide. I learned (during this blog hop, actually! ), that half of these colors are woven with two different colored threads to produce the main color, while the other half are woven with a color and white to produce a chambray look. While I usually like my like my quilt to be different enough from the inspiration that it feels like something new, sometimes I like a quilt so much that I want the same one for myself. This is the case here – I’ve always held a soft spot in my heart for string quilts (I’ve made quite a few, and have a tutorial on how to make a string block here! ), and I really love how the blocks in this quilt use the same fabrics in an alternating fashion. I also am fond of the fact that mixed in with the solids, there are a number of other solids and stripes. Since each block uses two colors, I decided to sew strips together into strip sets and then cut my square, rather than using foundation piecing. I think it was a lot faster, especially since I was able to cut a few squares from each strip set. Like the inspiration quilt, I wanted to add in a few extra fabrics to help increase the size and to add a bit of extra interest – I raided my stash and was happy to stumble upon a couple Japanese bundles I had bought a while back from Westwood Acres (they have the latest First of Infinity and other great Japanese bundles available now) – the florals just seemed appropriate, and I was mighty excited to find the Suzuko Koseki stripes, especially since I could cut them so they ran perpendicular to the stripes in my blocks. I love how the quilt turned out – I wish you could see it in person, because the shot cottons really add something extra that I’m not sure you can really see in these photos. These new solids will be available in April, so be sure to look for them then! Or, leave a comment here to be entered to win this great fat quarter bundle of all of these beautiful colors. One comment per person, please! I’ll select a winner Friday evening. Thanks for all for playing along! Also, be sure to check out these posts from earlier this week about the Artisan Cottons – each blog will also be hosting a giveaway in case you want to up your odds! This entry was posted in Fabric, Posts about Quilts, Quilts and tagged artisan cottons, cross weaves, handmade, quilt top, roderick kiracofe, shot cottons, string quilt, unconventional & unexpected, windham fabrics. Bookmark the permalink. Pick me, pick me! What great colours. The instagram pic really shows how beautiful the colours are. Love the bundle of shot cottons…they are like lollies. Niiiiiice quilt!!!! So bright and fun in the winter!! Those solids are so pretty! I’ve yet to use a shot cotton, and I’d love the opportunity to try! The shot cottons are so lovely, the picture of the bundle almost makes me salivating; I want to make something with this gorgeous fabric! Beautiful quilt! I’ve never used shot cottons. Thanks for the chance to win some. Those shot cottons are lovely! I’d love a chance to play with them! Great quilts! Would love to use these for a project I have in mind. Thanks for the chance. Beautiful fabric, thanks for the chance to winsome. your quilt is beautiful and I love the fabric. Thanks for the giveaway. The colours are lovely, I’d love to win some – thanks for the chance. Your quilt looks lovely. I’m really interested in shot cottons and would love to try them out. Thanks for the opportunity! Beautiful fabric. 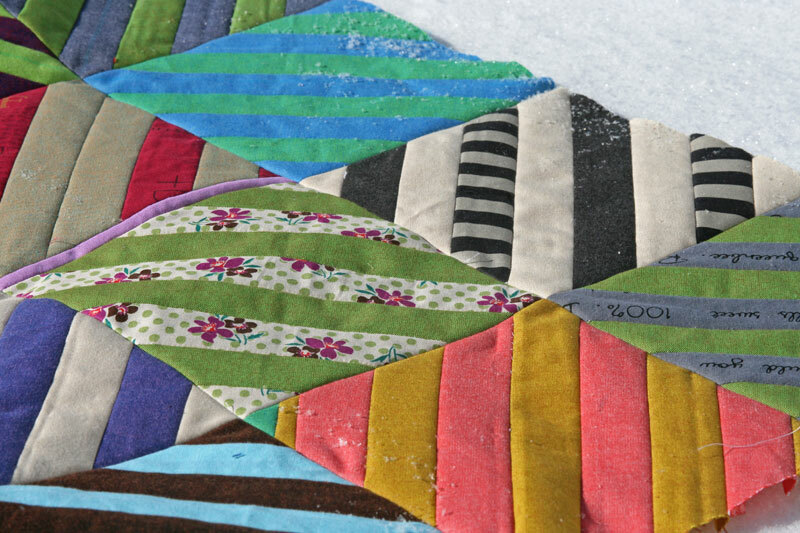 Would love the chance to win that fabulous bundle of solids and make my own string quilt. That bundle of shot cottons would compliment my stash beautifully. Thanks! Woman, you have sold me more fabrics than any store in the land! Every quilt you make has that special Ashley something that makes me wish I had made it and this one is no exception. I have typewriters, llamas, FFA2, and I must admit that for a brief while I had to stop following you to protect my bank account. That didn’t last long because I couldn’t stand not seeing your creations so of course I had to read your old posts, like subscribing to back issues. Now I’m practicing a disciplined life sewing from my stash, which has some good potential, thanks to you. I love shot cottons, I love solids, and I would absolutely love to have these! In fact, I can also credit you with a bit of Denyse that’s waiting to become a log cabin, and this stack could make that quilt a reality. Are you understanding me here? I sat on my hands during your IG destash and have questioned my sanity about that, but winning this bundle would restore my peace. Love the stripes! Great job! That is a gorgeous bundle! Thanks for the inspiration! i’d love to meet the shot cottons “in person” and play around with them. Fabulous quilt as always – I’m a big fan of stripes of all kinds! And those shot cottons look gorgeous! Lovely quilt and count me in for the giveaway! I love shot cottons, especially in all-solids quilts. They add extra beauty. And your stripe quilt is gorgeous! Beautiful colours, and a gorgeous quilt as always! OHHH I love your quilt–now I want to make one 🙁 and would DIE if I won the fat quarter bundle. I wonder if they are thin like some of the shot cotton fabrics I have seen or are they heavier–like quilt weight? ohh the quilt is beautiful! Thank for the chance. I love love love the quilt. You are such an inspiration. I would love to experiment with the shot cottons too! Wow, absolutely gorgeous bundle. I need some of these! there is so much to love about this quilt. The colours are lovely and I like the extra surprise of the prints you have used. I am a newbie to patchwork and quilting and I’m so glad I found your blog today. I’m going to have a good look round tonight as I learned so much just from this one post! I love the quilt as well as the collection….would love to win!! Love your quilt. Shot cottons are so much more interesting than solids. Thanks for a chance to win! I love this quilt. I just bout a yard of dark carbon gray shot cotton to use with some hand dyes. I would love the chance to win and add to my plans with the gray. I love your quilt and have the book sitting on my nightstand to enjoy when I get a minute. I’ve been fascinated with string quilts for a long time and actually made one early on in my quilting adventures. Might be time to make another! Fabulous quilt and fabulous fabric. Would love the chance to sew with the shot cottons. Beautiful! I plan on trying some Shot cottons. I’d love to win. I’m working with shot cottons for the first time and am loving them! So beautiful, both fabric and quilt. Can’t wait to start something new. I love your blog and would love to win this giveaway! Great fabrics! I’m a brand-new quilter, and have been building my stash with all the cool prints I come across. I need to start adding solids! 🙂 I’m stunned by your quilt–I can’t imagine lining up all of those diagonals as well as you did, in a million years! These fabrics are gorgeous. Thanks! Really nice quilt! I just made a string quilt and I am in love with it. Bravo! Just gorgeous! Can’t wait to see these shot cottons in person! What a great technique for those blocks! Thanks so much for the generous giveaway. They would make a great addition to any stash! You are right….this is one Great bundle of fabrics! Love your quilt! Thanks for a chance to win this great FQ bundle. My stash is really lacking solids so this bundle is definitely needed!! Thanks for the chance to win. Oh what a beautiful bundle…and quilt top! Thanks for hosting this giveaway. Beautiful colors! I’d love to add these to my stash! What a gorgeous quilt! I love shot cottons. I have not used shot cottons yet, but I am dying to! I fondle them every time I see them. Thank you for a chance to win some! I love how the solids stand out and fool the eye when the prints were added. Beautiful colors. Wow! Your quilt is stunning and vibrant. I’ve heard so much about shot cottons and would love to cut into this bundle!! Thanks for the chance! I love solids with some depth! There is a lot of color happening and I think you did a great job. The occasional double made me go back numerous times just to find those squares. The one with a touch of green at the very corner was a pleasant and fun surprise. These are beautiful fabrics. They are beautiful with each other and would be beautiful with prints, too. Thanks for a fantastic giveaway. I ,love your quilt, and the fabrics are great! Your quilt is STRONG & I love it! Colors are beautiful on screen – I can only imagine the effect in person! oh, I love this! these fabrics are just so darned great. I can only imagine how fab it must look in person! These shot cottons are fabulous in the pictures. I can only imagine how great they would be up close! I’ve never done a quilt in solids before and love these colors! Great bundle! I didn’t know about the weaving intricacies. Thanks for the info! Love these Shot Cottons. They are so versatile and would give the look of linen in some cases. Hoping they might be coming my way in the Great White North! Love the quilt, including the little variations in the design. Great colors, too. I love shot cottons, and I love all your quilts! Love the quilt & thanks for a chance to win some gorgeous shot cotton! I love the Yellow/Gold in the bundle. I have never made a string quilt before, it looks amazing with the shot cottons and little pops of pattern scattered throughout! Lovely quilt! I love shot cottons. I used them when I first started quilting, not knowing what they were. I still have a fondness for them 6 years later. oh fun! I love to see more shot cottons enter the market, they are so beautiful to work with! Ohhh these are gorgeous. I love your work! I love how your quilt turned out. Would be wonderful to win some of these cottons. The colors are fantastic. Incredibly beautiful quilt! The mix of solids and prints is gorgeous and those shot cottons look so soft and lush. Every quilt should have some stripes and dots…love it, I want to make one, need that fabric…. Wow, those are beautiful. Thank you for the giveaway. I realize I have NO SOLIDS in my stash!! Thanks for the giveaway opportunity! I really loved your quilt, It would be great fun to try something similar with the bundle! I have never worked with shot cotton…a new experience. The added sheen gives the fabric a party dress look! Thanks for a chance to win a bundle. Beautiful quilt, I love the design. Thanks for the chance to win such great fabric. I love that Echo quilt also, and I have to make one too! The fabric is gorgeous! Thanks! The shot cottons look great in the pictures, and I know the pictures don’t do them justice! Beautiful quilt and yes I would love to win this FQ bundle! Mmmm beautiful colors, I’d use them just the way you have, it’s is lovely and I love string blocks too! It’s lovely! Thanks for the chance to win some and work with it ourselves! I would love to make a string quilt someday! I love the colors in this bundle. This bundle would be a lot of fun with yesterdays quilt! I love these solids! I have many ideas to incorporate them! Your quilt is lovely as are the fabrics. Thanks for the close-ups. The chambray effect does show up in the darker fabrics. String quilt is now on my to do list. I like strong saturated colors that make me happy, especially during the gloom of winter. Your quilt is exceptional, and you are right, piecing strips and cutting blocks out is way faster than foundation piecing, and more fun for me anyways. For a person that uses solids almost exclusively, because I really do not know how to incorporate prints in my designs, I have never tried shot cottons. Crazy, right? Maybe this will give me an incentive. Happy quilting! adore the striped quilt, I can imagine how wonderful it looks with the variation from the cross weaves. I’ve loved every piece that I’ve had through my hands. What beautiful colors!! Thank you for the giveaway chance. I love these, I recently made a baby quilt from bright solids bordered in kiddie prints…cAN’T HAVE ENOUGH OF THESE IN MY STASH. Your quilt is gorgeous! I love the colors and I love the depth and texture of those cottons. I would love to win a bundle. Wonderful colors would love to add them to my quilts. Such beautiful colors! I would love get the chance to play with them! Great effect the strips have in your quilt, pretty bundle of fabric. The fabrics look amazing! A beautiful quilt! What a great giveaway! I love the shot cottons. I’d love to get my hands on that gorgeous bundle! Thank you for this giveaway! Wonderful quilt and amazing bundle! I would love to have these fabrics. Thnaks for great giveaway. I do love the depth and richness of shot cottons. Your quilt is so wonderful. I love the texture they give!!! I would love to work with some! chance to win some of this gorgeous fabric. You are an inspiration . Beautiful colors! Hope I win. Thanks for the chance. I also love the crossweaves. Thanks for sharing! I’m loving these shot cottons!! Thanks for the opportunity! Love those solids! Thanks for sharing with us. That is a lovely quilt! I wish I had your imagination/talent with putting fabrics together. I have never made anything with Shot Cottons, but I have been buying teeny bits of them over time, by getting small charm packs. Sort of like collecting Liberty of London’s Tana Lawn….lol. Think how much fun it would be for me to open and pet that fabric!! Fabulous quilt, I love strings! The bundle looks gorgeous! this quilt looks amazing. I love solid fabrics! I love working with shot cottons! I love geometric designs, so I really like this quilt. These colors in the fabric…so pretty. Thanks for the chance to win. I’m a sucker for shot cottons! Would love to try these new cross weaves! love these beautiful fabrics! thanks for the chance to win! I just love the settings you choose to display your quilts. Your shot cotton quilt is awesome. I love how you added other fabrics to make it sew unique! These fabrics are lovely! Thank you for the opportunity! I heart that bundle and your quilt! Love the colors and this quilt. You make the string quilt look fresh. Love your quilt-as always. I enjoy shot cottons and look forward to seeing this new version in the shops. I do like the added depth they add–not so flat looking as with some solids. Love these colors and how you put them all together in your quilt! I’ve never worked with shot cottons, but I am itching to after this tour! Thanks! Oh, so pretty! Great give away! Beautiful quilt! Love the quilt – how could you not? I really like that you added the floral strips – very nice touch. Never having used shot cottons, winning this bundle would definitely fix that problem. Thanks for sharing. WOW lovely! Shot cottons have such great depth. I’d love to win the bundle. thanks for the chance! Love the quilt! Can’t wait to try these fabrics out! As always your work is to die for! I hadn’t really thought much about shot cottons but seeing this layout is inspiring! 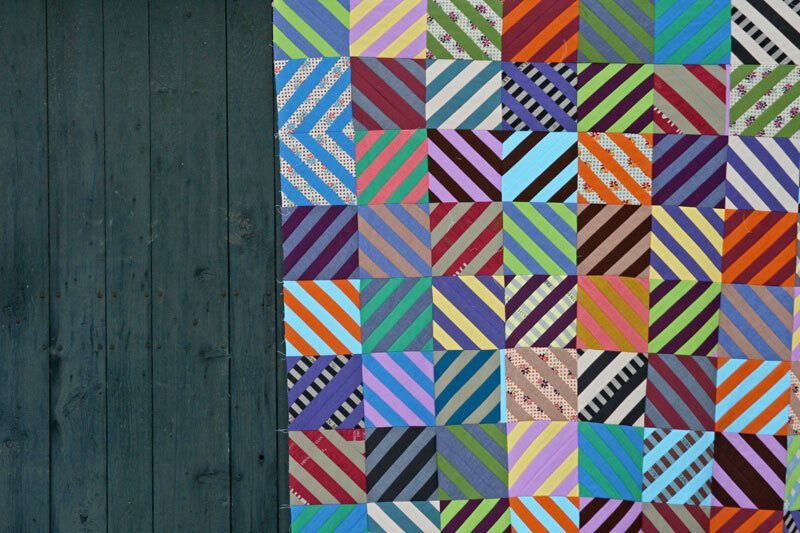 I love that these solids aren’t really solids – yet another quilt of yours to inspire! Lovely shot cottons and I love what you did with them. Thank you for the giveaway. The design is so eyecatching. Combining florals with the solids added a lot more punch. Fun! I’d love to try this, too! beautiful quilt! Perfect for those lovely fabrics. Thanks for the chance at that wonderful bundle! This quilt is beautiful! I feel like these particular pictures don’t do the fabrics or the fabulous quilt justice! I think I will try making the string blocks using strip piecing. I’ve never seen that idea before. Thanks! Love shot cottons and I can’t wait to try these out! Beautiful quilt — and beautiful fabrics! Thanks for offering them! Love that quilt. Those fabrics are beautiful. Such a beautiful quilt I love the juxtaposition of the stripes! And the shot cottons are quite lovely! Awesome! I love shot cottons! oh my, these look fun to play with!! The quilt is beautiful. Would love to try these. That quilt is beautiful, I love the bold colors of block stripes and I like the way you worked in two stripes that are completely out of the original design. Great job and beautiful solids! Oh my word… so beautiful! I love stripes, and especially like the sweet little florals mixed in too. Stunning fabric. The quilt top is beautiful! I love how these colors are a bit different (in a good way!) than the colors I’d normally gravitate towards. Wow, so colourful! I love shot cottons and I’m glad these are quilting weight. Love string quilts & that is beautiful! Very excited to try some shot cottons!! I love the added stripes. i am learning so much about shot cotton thru this blog hop! I’m dying to work with some…I can hardly wait! Your quilt came out beautifully, quite striking! I love your quilts and this one is no exception. The shot cottons do show in the quilt – solids tend to look flat but the shots and depth and dimension. Thanks for the chance to win! I love shot cottons, too, and would love to try Windham’s new line. Yes, please! I love shot cottons! I’ve just started collecting solids, my 2015 goal to move into the 21st century w all you “young” ones. I love making quilts from solids, but have never tried shot cottons before – these look really gorgeous! New colors for the palette is always a great thing. I love the peeks of prints you’ve put into this. What gorgeous colors! Thank you for the chance to win! I’m going to be starting a Dear Jane quilt soon, and I had planned on using dupioni for their iridescence. The shot cottons I’d found seemed either too loosely woven and ravelly or too heavy for the smaller sized pieces this quilt requires. Now, I’m reconsidering. These shot cottons look perfect, and there is a great range of beautiful colours. Thanks for the chance to win. Fabulous quilt! Lots of really great colours in the Artisan cottons range too. You did it again! Awesome design. Amazed how you keep coming up with original quilty ideas. This is such a lovely stack of colors. I really like the look of shot cotton . I love shot cottons and these just belong in a project I have in mind. Win or buy, I see many of them in my stash in the future. I would love to win this!! So gorgeous!! Pretty! I was just explaining shot cottons to someone earlier this month! I am always so inspired by your quilts. I would love to do a solid quilt with this bundle. 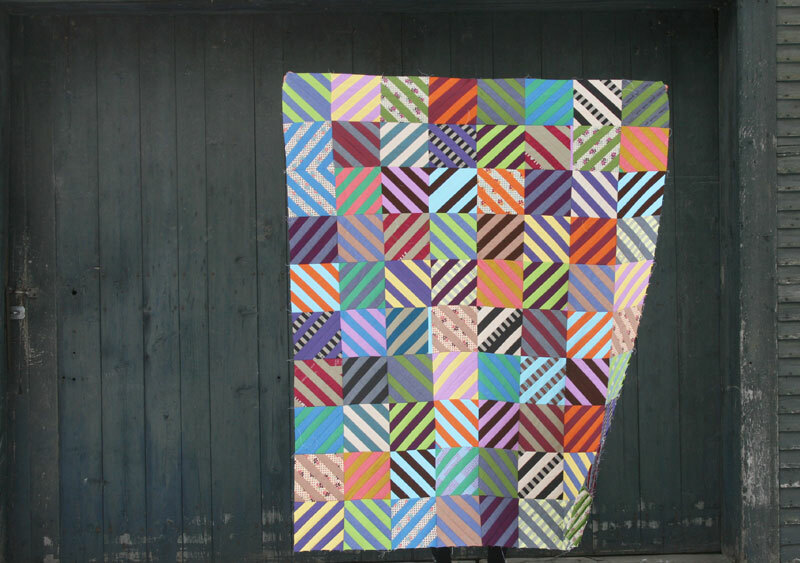 I love this quilt – and love the thought of strip piecing it! I’ve been leaning towards solids lately as well! What an amazing quilt! I’m sure the shot cotton really glows. Would love to see the fabric in person. Oooh, that is beautiful fabric! And such a pretty quilt! Your quilt is wonderful! I would love to try some shot cottons, this bundle has such lovely colors! Pretty fabrics! Thanks for the chance to win them! Love your quilt and so glad to see an expanding availability of shot cottons! Love shot cottons. Your quilt is wonderful. Thanks for the chance to win these lovely shot cottons. I love to make stripe quilts with different fabrics. They are so interesting. I save pieces of binding. My bee gives these quilts to the women vets hospital In Palo Alto. They are in need. They really are beautiful colours aren’t they? And they look like a lovely texture too. Thanks for the opportunity to win! LOVE these fabrics! Shot cottons are my favorite way to work with solids. :) Your quilt is fantastic! Great idea to add in the little florals too. Love that! Beautiful colours. Would like to give them a go! These Artisan shot cottons are quite striking. I would love to try them for myself. Thank you for sharing your lovely quilt and for the opportunity to win a bundle of this new fabric line! Lovely bundle, and I’m sure they look even better in person, as shot cottons are so tricky to photograph. And I love the idea of mixing solids and florals. Wonderful fabrics, I am using solids more and more recently. Lovely quilt. And beautiful fabrics. I love shot cotton! I love this kind of fabric! solids are great, patterns are great, but these shot fabrics are just phantastic. Oh!!!! I love shot cottons and chambrays. They add dimension so wonderfully! Thank you for a chance to win this gorgeous bundle!!! I love shot cottons! Your quilt is gorgeous. These colors are great – so many possibilities! You did a great job using them in your quilt. Love the graphic look of this quilt! Thanks for the giveaway! I’ve been wanting to try something with shot cottons. Wow! How beautiful! Thanks for the chance. Love the quilt. Such great colours. HI,a really neat looking quilt! Lovely interpretation of the original quilt! I’ve also wanted to pull many of the “Unconventional and Unexpected” quilts right from the pages. But, I find their unique improvisational character impossible to duplicate. Your quilt is a beautiful homage, with its own personality. Well done! Beautiful colors indeed! I may have to have just that quilt myself. Love the quilt and thank you for showing us the inspiration for it! String quilt, yep, now on my bucket list! I love working with solids. Thank you for offering. These cottons look so nice, and I love the quilt top too. They look so soft and beautiful !!! These really are beautiful–and so is your quilt:) You are right about the way the shot cottons are woven. The subtlety of the 2 colors woven to make one fabric really gives each fabric such depth. Just beautiful! Great fabrics! I love your quilt! Oh, it turned out so beautifully!! Great fabrics! I love your quilt. I need more solids in my stash. Thanks for the giveaway. Beautiful quilt! The solids are amazing. I just read an article about shot fabrics this week and thought I’d love to make a new quilt with them! I love your quilt and would love to make something as nice. I have had that, “I want that quilt feeling” many times from looking at your quilts! This one is great! Thanks for a chance for the fabric. I have always wanted to try shot cottons… Keeping my fingers crossed! Such beautiful fabrics and such a stunning quilt! I love the fabrics and colours you chose for your quilt – beautiful! I love love that quilt. The solids are more interesting with the way you have done them! Thanks for the awesome giveaway! love the depth of color in the shot cottons! Your quilting is so inspirational. Every quilt you makes me want to run to the sewing room. Shot cottons really are the best solids. And I love what you did with these! Your quilt is so pretty. Thank you for sharing it. The bundle is pretty too, thanks for the chance to win. I’ve also shared your giveaway on my Giveaway List for sewers & quilters at wowilikethat.com. Thanks again. Beautiful colors and great quilt!! All of your quilts are simply stunning. Thanks for the chance at the giveaway. Beautiful quilt. I love how you mixed the different fabric collections together. Sometimes I don’t have the best of luck mixing fabric collections. I am new to the term “shot” cottons. Where have I been? Your quilt looks great! Shot cottons are super special! Thanks for the giveaway. You did a beautiful job on that quilt! The cottons look wonderful-never worked with shot cottons but sure would like to! Thanks for the chance to win this bundle. I love your quilt! I think every quilt should have stripes in it. Thanks for the chance to win this gorgeous bundle. I’ve used shot cottons before and they are so lovely. This set of fabrics is very scrumptious! Would love to make a quilt with these. Thanks for sharing what you did with yours and the chance to win! The strips sets are so cool, I bet your quilt came together quickly that way. Shot cottons are so stunning and they do present in your pics. Thanks for sharing the info on Chambray’s, I always thought they had a white weave in their midst. I appreciate your inspiration and the giveaway. It’s quite generous. That’s inspiring Ashley. Oooh the possibilities! After attending Gwen Marston’s camp, I have come to love shot cottons – I made my first solids quilt at camp and have been in love with them ever since. Thanks for a great blog! What a great bundle- and I love that quilt! It’s mesmerizing! 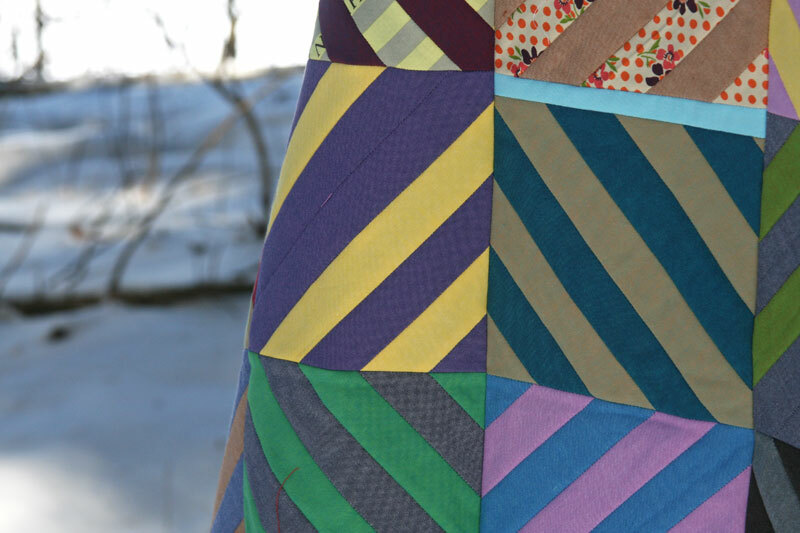 Love the combination of fabrics and colors in your quilt! Cannot wait for the new shot cottons — thanks for hosting the hop! Beautiful quilt and gorgeous bundle! Love shot cottons and can’t wait to see these when they hit the stores! Such an awesome giveaway! I love your quilt with all the bright colors and stripes! I’m not very good at lining blocks up yet but I’ll get there! I still love my screwups! Thanks so much! What a great quilt! I love the colours as well as it’s organised randomness. This quilt is so beautiful! And such a great pop of colour in the grey winter months! I’d love to win so thanks for the chance. One of the things on my list is to make something with shot cottons. Your quilt is lovely! Such a pretty quilt! Love the rich colors! Love the shot cottons. I think your quilt turned out marvelous. love the colors! a lot of fun imagining a new quilt! Great colors in this bundle. I can think of a few projects for these…. love the quilt. I have been following you for several years and am continually amazed at you creativity! Thanks for the opportunity to win! these are beautiful. i go gaga for shot cottons! Great looking quilt. I love these shot cottons too. Thanks for the inspiration. Your quilt is beautiful! I would love to try some shot cottons! I love the way your beautiful quilt keeps one’s eyes moving. The use of an occasional print is delightful too! Thanks for sharing this, and thanks for the chance to win these gorgeous fabrics! This is a beautiful quilt! Love the graphic design too! Lovely bundle of fabrics. What a fun quilt. <3 this beautiful bundle. I haven't used Windham fabrics before, but I would love to give them a try. Your quilt is gorgeous! Love the colours and the stipes. Thanks for the giveaway. What a vibrant quilt it makes! Oh my. These are beautiful! Nothing like a good chambray! Lovely quilt (as always). Love how you put this quilt together and the prints really add to the overall beauty. Thanks for a chance to win this bundle of fun. Your Echo Quilt is so colorful! I love all the bright solids! The bias edges would shy me away, yours turned out lovely! Would be amazing to have such beautiful solids to quilt with. I love that you’ve mixed some patterned fabric in with the solids! So much movement in the design. Great work!! Great quilt, beautiful fabrics and amazing inspiration, thank you! Beutiful. Thank you for the chance. I love the look of the shot cottons, especially paired with the florals! Mmm, I can see how it would be fun to pair this Japanese florals with these shot cottons; they have such a lovely hand and the prints Play of the weaves really nicely. I love the perpendicular stripes too! I love what you did with the collection. Thank you for the opportunity! Thanks for showing the beautiful colors against the snow for a big impact! Fabulous! Love all those interconnecting stripes! Pick me, pick me. Love these. Just beautiful! Thanks for the opportunity! Such a fun and vibrant quilt! The more ways that I see these new modern fabrics used the more I fall in love with them..you did a great job on that quilt! I’m a novice with a big family and little time for sewing but I’ve bookmarked this page for my next quilt and would love to win the bundle to make it happen. I’ve never commented before but I am an avid reader and fan of your work! I love shot cottons and usually have to use them so sparingly that I make tiny little wallhangings with them. I would be so thrilled to have a generous bundle to play with! Those fabrics are really beautiful. Thanks for the opportunity to win !! I’d love to be entered for this giveaway if it’s open to internationals. The shot cottons are just gorgeous. I’d love to use them in some garments as well as piecing. Love these colors! I could let my imagination run wild! so much more than solids I love the way shot cottons shimmer. Thank you for the chance to win. These seem to have a ‘tailoring’ quality that you don’t always see in quilt cotton, exciting. such beautiful vibrant colors. I’d love to sew with some of these. The quilt screams, “happy “. Beautiful. Yum, both the quilt and the fabrics. They look scrumptious! Wish i could see and touch in person! I’ve never worked with shot cottons – thanks for the chance to do so! And that’s a nice quilt! Love this quilt! The colours! Wow! Great quilt and beautiful fabrics. I’d love to win this giveaway! Beautiful quilt and love the shots. They have so much character. I’m loving the quilts made with this fabric line. The colors just shine! Lovely quilt. Amazing the depth of color achieved with shot cottons. Thank you for the giveaway. This is making me want to make another string quilt too. I can’t wait to see how you’ll quilt this one. Thanks for the post. I always enjoy your quilts. I love shot cottons but have yet worked with them. They do add a bit extra to the quilt! What a great collection of colors! The texture of those fabrics in the photo is just beautiful. And your quilt is lovely! I love shot cottons such a great color combo in your quilt!!! I love this new fabric line! So beautiful. I always look forward to seeing your posts. Thanks for the nice giveaway. Stunning fabric with endless possibilities. Awesome quilt! !i haven’t sewn with shot cottons.thanks for a chance to! Ashley, I am a quilter in progress. Just recently found you on the internet, and I’m totally hooked. I have already tried to make/re-make some of your quilts. I like to add my own twist to quilts, as I see things somewhat “out” of the box. I love the stripes, and I would LOVE to experiment with this stack of fabric. Thank you for the contest!!! Wow. They have such interesting colors. Love the stripes! And fabric, of course, always more fabric! Ohhh, I love shot cottons! And now there’s going to be even more choices!!! 😀 This turned out really pretty, and I love the fabrics you chose to go with the shot cottons. I don’t blog. Perhaps I should. I could start by talking about the bundle of solids I won, if I won! Wow this is really cool and fun. I think even I could do this. Thanks for sharing. That’s a gorgeous range of colors! I am keeping my fingers crossed; this is one of those giveaways when you REALLY want to win! These shot cottons are fantastic. Lovely quilt and great fabrics! Beautiful solids…I would love to add them to my stash! The colors are beautiful! 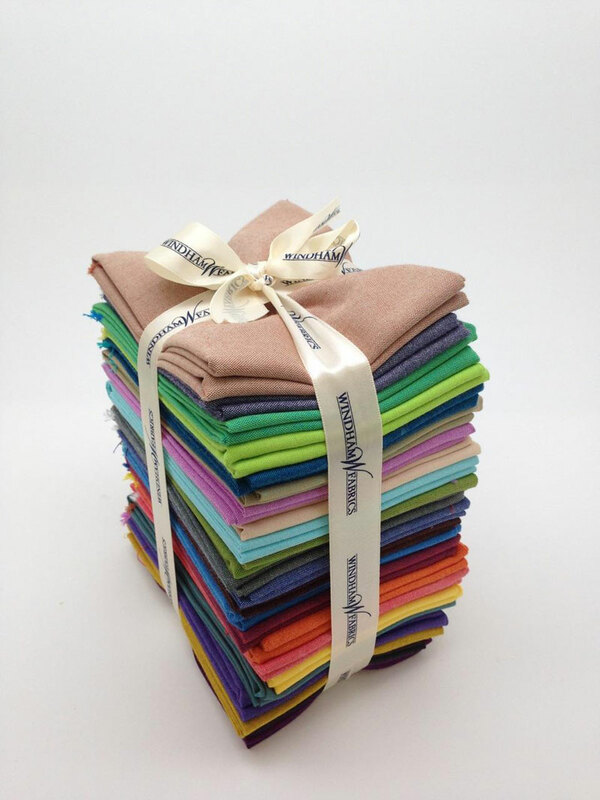 I would love the chance to sew with these… thanks for the great giveaway! Great quilt! Delicious colors and your prints add the perfect punch to the quilt. Can’t wait to see and feel the solids in person. I have exactly 2 solid colors in my stash Medium gray and Berry. I would love a chance to make a modern quilt using solids. I have seen so many fantastic inspirational quilts to try using solids. What a fun quilt! Time and time again a simple pattern yields stunning results and oh this fabric is terrific. Thanks for the opportunity to try it too! Love to win these beauties. Thank you for the opportunity. These shot colored fabrics are beautiful in your quilt. Would love to give this fabric a try. So in love with shot cottons, and such a pretty quilt! Wow – thanks for all the inspiration – I adore shot cottons and look forward to this new line. Beautiful quilt top! And I love those shot cottons! Thank you for the opportunity. 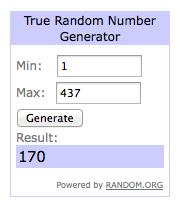 Thank you so much for the giveaway! I absolutely lived your quilt. Beautiful quilt! I’d love to win the bundle too. Thanks for the chance to win! I would really love to try these shot cottons. Sure could use those lovely fabrics. My stash is getting low. Appreciate the chance to win these beautiful fabrics! These shot cottons have such beautiful dimension. I would love to try an EPP project with these vibrant solids. Would love the opportunity to give these shot cottons a home! Loving that quilt. Thanks for the chance to win! I’m a sucker for anything made with shot cotton, chambray, or yarn-dyed. It’s an addition, really 🙂 Thanks for the giveaway! These would be great basics. Thanks for the chance. Pick me! I’d love to play with these fabrics…. I would love to win the Artisan Cottons — they are absolutely gorgeous! — as is your quilt! what a lovely quilt you have made and I love it that I am not the only one who “cheats” at the paper-piecing! I love the shot cottons! I have worked with the Kaffe Fassets and would love to try the Windhams. They are so beautiful! These fabrics look amazing, as does your quilt! I would love to try making a quilt from only solid colours and think the shot effect makes them more interesting in different lights. Thanks for the chance to enter. That is such an awesome quilt. Thanks for the chance to win those wonderful fabrics. These are beautiful, and I love your quilt. Thanks! Interesting fabrics. Hope to win the bundle. Would go really well with my scrap quilts I make for charity. Thanks for the chance to win! The shot cottons kind of give it a primitive old timey feeling. Perfect for a quilt at my cabin! Thanks for the chance to win! Beautiful. I never thought of trying strip sets for that look. I’ll have to try that soon. Thanks for all your beautiful inspiration! i SO greatly admire how you put fabrics together! Love the dimension shot cottons add to a quilt. Thanks for the chance to win! There is such a richness in oakshott fabric. These are gorgeous and I’d love to work with them too! Oh yes! I’d love that gorgeous stack of colors. They do look like they’d be a great addition to lots of quilts. As always, Ashley, I’m intrigued with the little variations you use (prints, stripes, and the occasional double stripe) that make your quilts sizzle. I would love to see these added to my stash. Thanks for the giveaway. Gorgeous! I have just a few shot cottons on the shelf, they’re gorgeous…so hard to cut into, though! Beautiful as always! Thanks for the chance to win! you can never have too much fabric!!! LOVE your quilt! After years of raising my girls and working and having crafty pursuits take a back seat, I’m slowing getting back in to sewing … what a lovely bundle that would be to add to my stash! This is a beautiful piece. And, as always, pictured in a beautiful environment. shot cottons are my favorite. Great quilt and a very effective use of some wonderful colors. I too love string quilts so this pattern speaks to me too. I will make this! Beautiful. It is ….A Beautiful, simple but striking quilt. Lovely to see…and what great colours. Your quilt is inspiring and the colors are fabulous! Beautiful quilt♡ I would love to get my hands on those fat quarters! I have always wanted to try a string quilt but didn’t always like the randomness of them. I really like how yours turned out. It seems to be more organized and I like that. Those textures are amazing! And that quilt is astounding. Beautiful! A major inspiration for a new quilter. 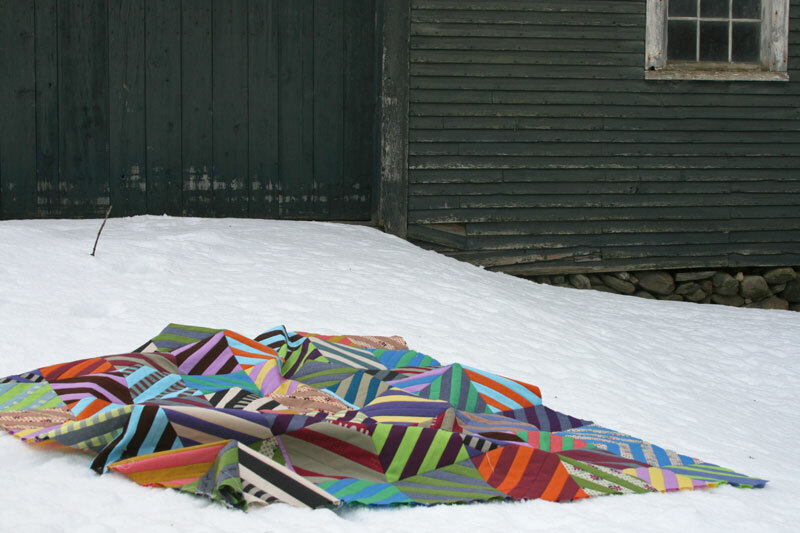 If it were not for your off-beat, unconventional designs and color combos, I would not quilt. I am not perfect and I cannot create something perfect. But I can create something beautiful, useful and oh so lovely to look at (just like you do!). Thank you for keeping me and so many others inspired! Beautiful! This post just sent me down a rabbit hole of string quilts you’ve done, my next try I think. Great group of colors — I find I’m using more solids now and this would be a great addition with a little kick! I am really intrigued by shot cottons, but I don’t have any. Thanks for the giveaway. I love seeing your quilts! Such inspiration….thank you. Also like how you did strip sets to make the block. I’m going to try that as I really like string quilts AND THIS GIVE AWAY STACK!!! Shot cloth is wonderful to work with. Your quilt is stunning and really shows off those gorgeous fabrics! Love the colors of your quilt. I think shot cottons always add some depth that plain one can’t. Oh my gosh, the neutrals. I love those tans and yellows. Your quilt is very nice. Really caught my eye – plan to try something very similar soon. Wow! What a beautiful quilt! And those colors are totally yum! I am a beginner and just started building my stash. This would help! Love the quilt and all those luscious colors. Would love to win the fabric! The colors are gorgeous – I’ve never purchased shot cottons but would love a chance to try them. Many thanks!